Opposite the Sluice Park (Parco Talon) , stretching on the left bank of the Reno, there is the Lido di Casalecchio. It is a beach with all the facilities of a seaside resort which can be reached from the town centre with a pleasant bike-ride, offering a splendid view of the sluice and the river. People from Casalecchio and Bologna started to frequent the Lido in the early 20th century. It was entirely destroyed by a violent flood in 1966 and it has recently opened to the public again after important restoration work carried out in 1998. 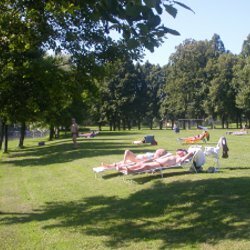 From spring to autumn, lots of people crowd the Lido to sunbathe on the grass or on the sand while listening to music. The Lido is also an ideal place for anyone who want to play sport outdoors as well as relaxing in the shade of a tree on the banks of the Reno. A snack barequipped with outdoor tables in the park of the Lido is open all day.